Utilizing the natural instincts of our highly trained working dogs, geese are moved with amazing efficiency without ever physically touching or harming the target species. Our prime objective is to eliminate existing geese from congregating on your property and reduce new birds from hatching to diminish the growth cycle. 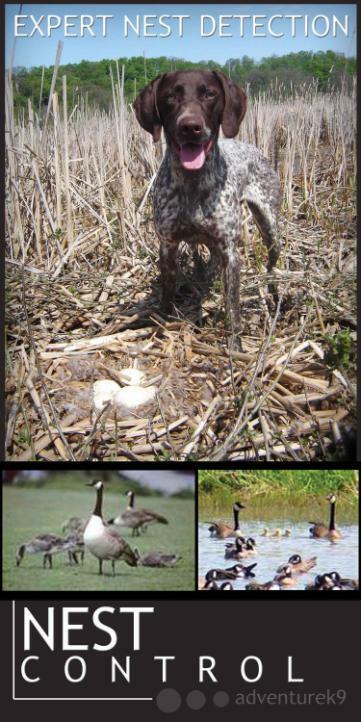 Nest control is a major proponant to this and must be managed carefully and skillfully under the necessary permits regulated within the Federal Migratory Birds laws and Canadian Wildlife Services. Nest control is the first key to the success of our program, as it immediately targets the underlying problem, the 'growth cycle'. The growth cycle occurs wherever geese congregate to nest, as goslings 'imprint' to that specific location, becoming permanent residents and raising their own brood within two years of reaching breeding maturity. Numbers of new birds being hatched into the area begin to compound quickly in a few short years, causing numbers of geese to dramatically increase. M i n u s the k i l l i n g, of course! 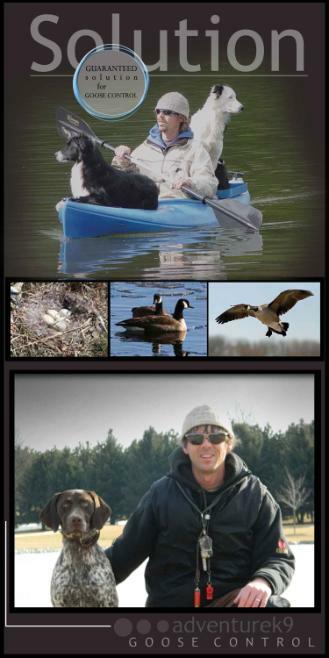 Canadian Wildlife Services, eggs are sterilized eliminating any chance of incubation or reproduction. This proactive approach is a key in the overall solution and reduction of goose numbers. 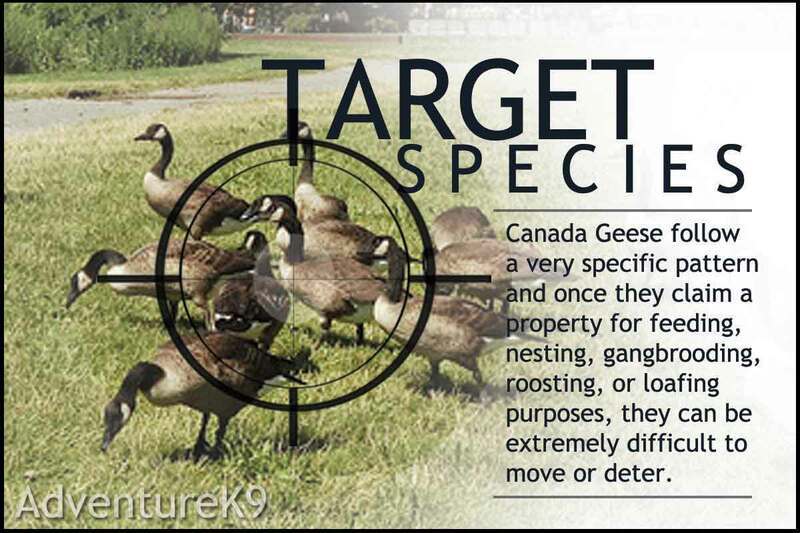 This program is designed as a total solution to both reduce numbers through nest control and aggressively condition any and all adult geese inhabiting your property to stay away. This approach causes the geese to develop a 'negative imprint' towards your property. 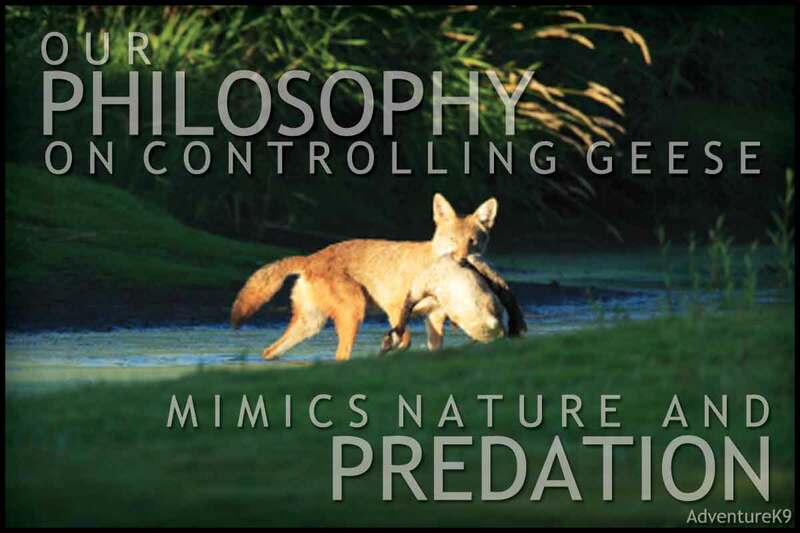 It requires extensive effort, particularly during the first and second year as we take the time necessary to establish ourselves and create the illusion of regular and permanent predators. property visits to monitor and effectively and completely control any and all geese from congregating on your grounds.